SolTerraLog: How big a deal is going small? The world we live in is trending toward using smaller, mobile devices for completing the tasks we do most; listening to music, watching movies and TV, communicating with friends and accessing the internet. A recent study by Google indicates that, as of February 2012, 38% of Americans own a smartphone. The same study says that 43% of all internet use comes from smartphones or tablet devices. Consumers want to be mobile. So what's the big deal about having a version of your website that is "mobile friendly"? Mobile websites are, generally, a condensed version of your full web site and will load faster than a full size site. Also, you are able to arrange information better, making your site easier to see and navigate on mobile devices. Look at these two images of the same site, http://adamscountytravel.org/. The image on the left is of the mobile version of this site. When you visit this site on a mobile device, it automatically redirects to this version of the site. The picture on the right is the full site. Imagine how much easier navigating the mobile site is on a mobile device. 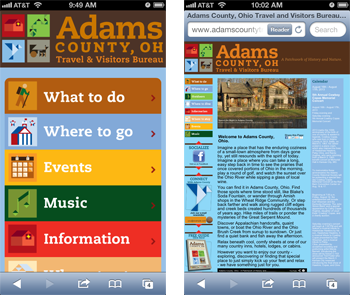 Another advantage of offering a mobile site is the professionalism a mobile site displays to users. When customers see that your site is easy to use on their mobile devices, they will be confident that your company keeps up with trends that are important to them. If you are as amazed by the volume mobile device usage as we are, have a look at Google's report titled Our Mobile Planet: Global Smartphone Users. If a mobile website is something you'd like to consider for you or your business, please contact us at info@solterra.us .